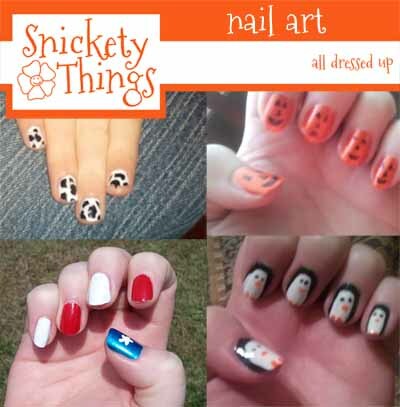 Have you seen all of the creative ways people are painting their fingernails lately? There are some great designs out there. Today I am going to talk about a few I have tried. My girls both love to have their nails painted in fun ways. When the Princess decided she wanted her nails painted for Halloween last year I didn't know what color to use. She was going as Jesse from Toy Story (costume from the post here) and I just couldn't think how Jesse would paint her nails. Then it hit me, cow print. I just painted a white base coat and then drew on the spots with a fine tip black paint pen, then did a clear top coat. I've never been big into painting my nails. After working in the chemistry field I realized that I usually could not keep the paint on the nails. Between gloves and other chemicals, it was just pointless. I decided that maybe it was time for me to try. If the Princess was going to have fancy nails for Halloween then I would too. I settled on jack-o-lanterns. I painted mine with an orange base coat and then used a fine tip Sharpie to draw on the faces. Each face is slightly different. Sorry it is blurry, I was using my phone to take the picture. 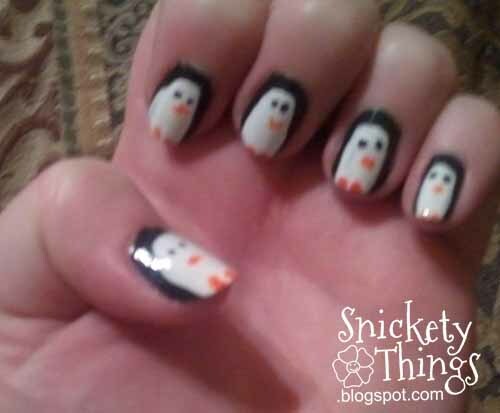 Later on I decided that I really wanted to do penguins. I started with a black base then painted the white over. The eyes were drawn with a fine tip black paint pen and the beak and feat were drawn with an orange paint pen. Again, blurry due to my phone. I painted mine and the girl's nails for Independence Day in red white and blue. The girl's nails did not have a star on the thumb, just the basic blue. I've also done lady bugs on the girl's, but did not take a picture. They rarely hold their hads still long enough to get a good picture. Since October, the above pictures are the only times I have painted my nails, and they only lasted a few days before it drove me crazy and I took it off again. I'm just not used to it being on there. The Princess has already decided what she wants for Halloween this year, although she has yet to share it with me. Boo only leaves her polish alone for a few hours before picking it off so I am less concerned with hers. Do you paint your nails in designs? Cute! I don't do my nails very often because I'm not real good at sitting still! I love your designs. I have a friend who does amazing things on nails. she's an art teacher by day and uses her nails as canvases! I'm not very artistic with mine. I have to keep them simple. 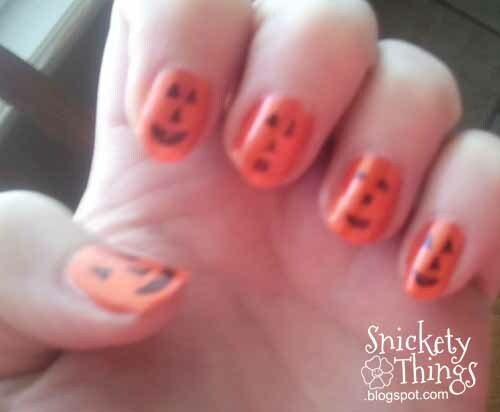 I used to do fancy nail art all the time back in high school but that was a very long time ago! 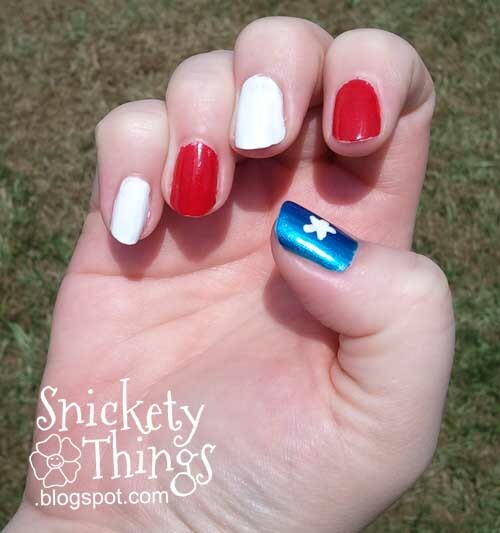 However, this week I was feeling a bit nostalgic and did flags on my nails for Independence Day! It is so fun to watch them as I type. I never did it in high school either. I can barley even keep clear polish on for long. It is really strange that it distracts me the way it does. Very cute. Love the penguins. I work with my hands. Painting, sanding, etc. Just keeping them filed seems an uphill battle. I used to do things like this when I was younger. I completely understand. Working at the library with books means mine get broken quite often. Just since that picture Wednesday one of mine are already broken to the bed. Very cute!! i love the penguins. I linked up my watermelon nails! These ideas are adorable! 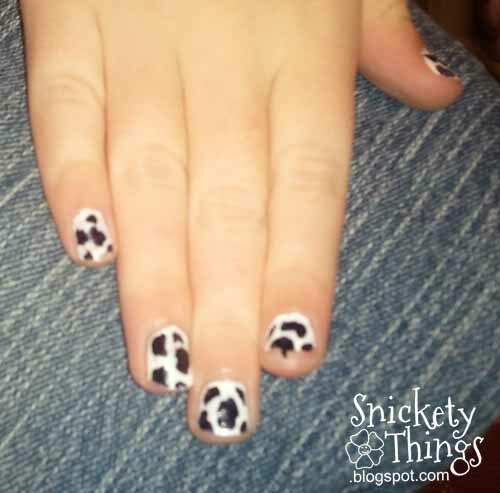 I love the cow nails for Jesse! Love the penguins! Too Cute! Adorable-the penguins are my favorite! I get frustrated with mine, too. That is why I don't have all of mine posted. Very cute! I like the penguins too.